Marinara is an Italian sauce made from fresh Roma tomatoes, herbs, onions and garlic, flavored and seasoned with freshly ground black pepper and salt. In India Marinara sauce is often known as Italian tomato sauce. In the USA Marinara sauce is extensively used and one can easily find bottled marinara sauce in the supermarkets, but nothing can beat homemade food. Wash and cut each tomatoes into 4 quarters. Wash, peel and cut carrots in one inch pieces. 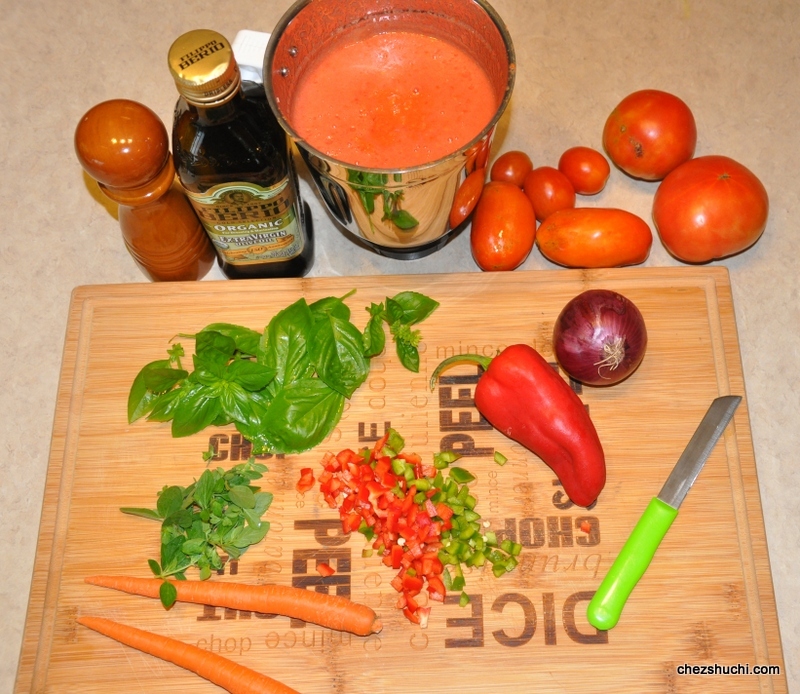 In the blender take tomatoes and carrots pieces and puree them. Wash and chop the basil leaves. I prefer to tear the basil leaves by hand. If you do not find fresh basil leaves, use dried ones. Wash the oregano leaves. You can also use dried oregano leaves. Heat olive oil in a pan/wok. Add finely chopped onions. Sauté for a minutes or until onions are translucent. Add chopped bell pepper and sauté for another minute. Add tomato and carrot puree, salt, red chili flakes, and freshly ground black pepper. Mix well. Let it cook on medium to low heat for about 20-25 minutes or until the sauce is thick and smooth. Add basil leaves and oregano. Mix well. You can add a hint of sugar if the sauce is too sour. Marinara sauce is ready to use. It can be stored in the fridge for a couple of days. You can also store it in the freezer and use it later. Use Marinara sauce in pasta or in pizza as required. Read the recipe of Pasta in marinara sauce. In traditional Italian cooking minced garlic is also used; since I do not use garlic in my cooking I haven't added it but feel free to add garlic with onions in the sauce. I have used a couple of carrots to make this recipe mild and tasty and also to give a slight sweetness to this recipe. Carrot also helps in balancing the sour flavor of tomatoes. You can add fresh herbs or dried Italian herbs as per taste and availability. You can easily grow Italian hebs at home from seeds or from a baby plant. 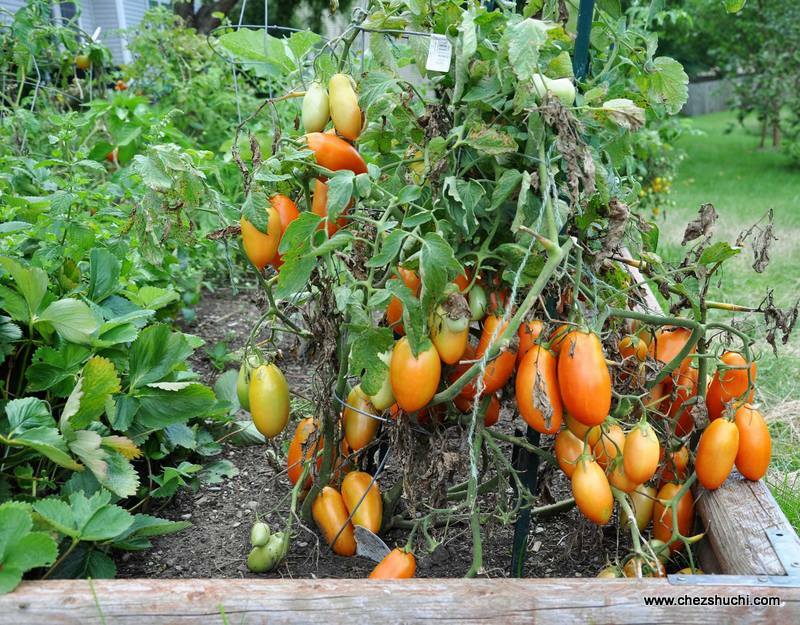 Read more about vegetable gardening. In the summers, you can make marinara sausce in bulk and freeze it in small containers. Make sure to freeze in small containers so that you can finish the entire bottle after defreezing it. It is not healthy to defrost the food and refreeze it.